Our range of products include allopathic medicines and ferrous ascorbate, folic acid. 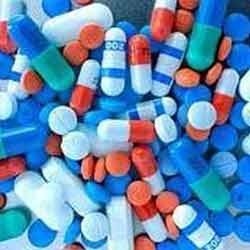 We are one of the renowned manufacturers and suppliers of a wide range of Allopathic Medicines. These Allopathic Medicines are manufactured from high quality active agents procured from reliable vendors of the market. Our Allopathic Medicines are widely demanded for providing instant relief and are manufactured in hygienically safe facilities. Our range of Allopathic Medicines is manufactured by following WHO standards ensuring, excellent quality and fast results. We are offering the range of Allopathic Medicines, as per the requirements of the clients’ at the most affordable rates. We are a prominent organization, engaged in providing superior quality Ferrous Ascorbate, Folic Acid & Zinc Tablet. The offered tablet is formulated by utilizing most exceptional quality chemical compounds and latest technology in agreement with set industry norms. Additionally, our offered tablet is tested entirely on varied parameters by our deft quality analysts. Clients can avail the offered tablet from us in varied specifications as per their different requirements.